The “Federalist financial revolution” may have jump-started the U.S. economy into modern growth, but the Free Banking System (1837-1862) did not play a direct role in sustaining it. Despite lowering entry barriers and extending banking into developing regions, we find in county-level data that free banks had little or no effect on growth. The result is not just a symptom of the era, as state-chartered banks seem to have strong and positive effects on manufacturing and urbanization. Do banks facilitate economic growth, and if so, what type of banks do so best? Matthew Jaremski and Peter Rousseau attempt to answer this question by looking at the economic impact of the entry of “free banks” to the US market for banking services in the mid-nineteenth century. Free banks, so called because they required no charter, were an early form of financial liberalisation which in the long-run proved to be unsuccessful; by 1863, one third of all the free banks ever created had closed. The advent of free banking laws lowered entry barriers because any group of individuals could establish a bank, as long as they fulfilled certain requirements set down by the state in which they operated. The incumbent charter banks, by contrast, required significant political lobbying before they were permitted to open. 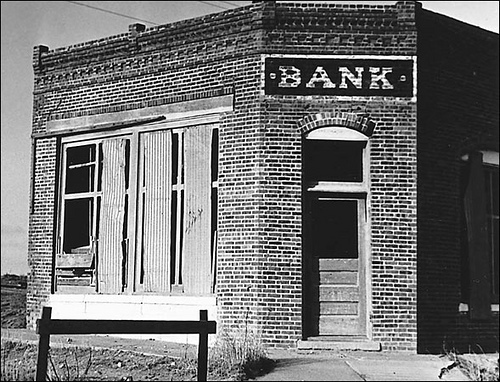 Jaremski and Rousseau look at a period of US history in which both types of bank operated side-by-side. Using county-level social, financial and economic data, they are able to track the impact, if any, of a bank opening on its locality. Overall, they find that banks of any kind had a strong effect on local growth, especially in manufacturing. But when differentiating the impact by bank type (charter versus free), charter banks had a positive effect while free banks had little or no effect on growth. So in conclusion, banks appear to facilitate economic growth, but free banks not so much. Why? The authors reckon it has something to do with: (1) what they were investing in (agriculture rather than manufacture); (2) what backed their note issues (some states required very little stable collateral); and (3) new banking legislation in the 1860s (which saw the advent of national banking). This paper, which was distributed by NEP-HIS 2013-02-03, is an example of an alternative use of working paper series: the distribution of soon-to-be-published journal articles that have already gone through peer review. Jaremski and Rousseau are about to have this article published in Economic Inquiry; it is already available there on Early View. Why do authors use working paper series for this purpose? Well, probably to improve the access to their work. Improving access to academic work is a very live political issue here in the UK. There is much talk about ways to make academic research available to the general public. The UK government seems to be in favour of something called Gold Access, where researchers pay to have their work published in journals (see here). This strikes me as a way to prop up the status quo, to support publishers’ existing business models, which in my opinion have come under incredible pressure from digital paper archiving and distribution services like RePEc. An alternative mooted by others has been dubbed Green Access, and is very much the spirit of what Jaremski and Rousseau do here: in addition to publishing work in the standard way, through an established journal with peer review, academics make a version of their article available free-of-charge through their own website or their institution’s online archive, perhaps after some time delay. Many publishers seem dead against this route, perhaps because it threatens their business model more than Gold Access would. But I think putting pressure on their business is a good idea; I reckon that the likes of Elsevier need this pressure in order to curb their market power. The Economic History Society has recently sent at letter to the UK government committee tasked with looking into the issue of Open Access (see here). It is written from the perspective of not-for-profit academic publisher, and has a different assessment of the situation than me. I urge economic historians to read it and debate its implications, also those located outside of the UK. This entry was posted in Money & Banking and tagged banking, economic history, financial history, free banking, open access on 2013-02-13 by Chris Colvin.